Nagl, in Bacevich's terminology, is a "crusader." Crusaders believe that counterinsurgency wars are winnable, so the US government should reorganize its national security apparatus, including the military, to go forth and win them. Big crusaders, who see "the Long War" as a single overarching conflict, or a set of intertwined wars that need to be addressed in some common fashion. Big crusaders invent terms like GWOT to describe their belief system. 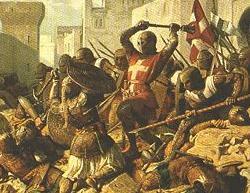 Little crusaders, who think that some of these wars are worth fighting, but there's no bigger meta-conflict at work. A little crusader might think that the war in Afghanistan or Iraq is winnable, but there's no "vast military enterprise undertaken on a global scale and likely to last decades" that we're compelled to fight. Conservatives, who want to push these little wars, low-intensity conflicts, or whatever the term du jour is, down the list of priorities. Whether we're not capable of doing a good job at fighting these wars, or the costs outweight the benefits, they're just not worth re-engineering the US defense apparatus to fight them. You might slice the philosophical or doctrinal distinctions even more finely, but you get the point. I'd classify myself as a little crusader, who believes passionately in taking these conflicts seriously. Creating some bigger story arc, however, isn't necessary to justify the changes needed to fight these conflicts better. In fact, the story arc of "big crusaders" creates dangerous misconceptions about connections that don't really exist. Back in the 1980s, people spoke about "global terror networks" as if SMERSH or SPECTRE were running the show behind the scenes. However, revolutionary groups that use similar methods don't necessarily belong to some larger network. (And, in fact, revolutionaries in the same country, using roughly the same methods, often compete with each other.) The occasional collaboration among them, such as sharing technical information about bomb-making or psychological warfare, is also not evidence of some greater network that only a "Long War" can ultimately defeat. Therefore, we're not just arguing semantics here. The notion that, if you're not a "conservative," you are thick as thieves with Bush, Cheney, Rumsfeld, and Wolfowitz, is just ludicrous. You might expect that the election of 2008--seven years after the 9/11 attacks and the invasion of Afghanistan, five years after the invasion of Iraq, and 19 years after the fall of the Berlin Wall--might be a referendum on American national security in a vexing era. Well, it is, sorta. The presidential candidates get partial credit. I don't expect someone with an eye on the Oval Office to tackle every difficult issue, especially those that the opposition might deliberately misinterpret. Therefore, don't expect to hear Obama and McCain debating over how many foreign or domestic terrorists are actually plotting to kill Americans civilians. And what's definitely off the agenda is anything like a proposal that the number is significantly less than most Americans assume it to be. I'm talking about something more substantive than the set of bullet points you'll find here, in the Defense section of his platform. A lot of undecideds, independents, and Republicans might be surprised by some elements of Obama's defense policy, such as a limited ballistic missile defense. And how can I argue with rebuilding the overstrained military? And don't get me started on McCain's issue breakdown. Iraq? Check. Homeland security? Uh, OK. National security? I kinda thought that "homeland security" was just part of national security, which in McCain speak means counterterrorism, expanding the size of the military, and modernizing its equipment. And the rest of the defense issues are nowhere to be found. Ahem. Interesting that the McCain campaign has more to say about Values with a capital V than NATO, Afghanistan, Russia, China, the horn of Africa, the G-8, counterinsurgency outside of Iraq, and Latin American combined. "How Hostages, And Nations, Get Liberated"
Forget Kennan's long telegram. These topics are more tactical than the average Walter Lippmann column. At a time when we should be talking about US grand strategy, and the lower level strategies that flow from it, the press seems incapable of doing more than responding to today's events. Every candidate says that big issues are at stake in every election, but in 2008, these claims have the virtue of being true. Putting the threat of terrorism into better perspective requires a much different discussion than, say, how much money should go to SOCOM in the next budget. Reviving our nation's indolent non-proliferation efforts starts with a discussion of what sort of threats biological, chemical, and nuclear technologies pose if not constrained. Building a missile defense is a second-order question. The people who have nothing to do with their time but raise important questions instead prefer to talk about, at best, derivative questions like, "So, when are we leaving Iraq?" At worst, newspeople and the commentariat waste valuable time talking about about trivia. The real core questions, around which there is still no national consensus, receive practically no attention at all. How worried should we be about future 9/11-like attacks? To what extent does US foreign policy depend on hard power? Soft power? (I like the term "leverage" a lot better, but you get the point. To what extent does US national security depend on alliances? Should we tailor our national security policies to fit within prescribed budgetary limits, or are we willing to sacrifice more national wealth to address these concerns? And so on. Maybe the highly-paid people in the press don't know what grand strategy is. After all, they're less concerned about the significance of Iraq than whether we win the war (or leave it). That attitude, the static-filled hiss of lesser issues, makes it hard to discern what all the noise about terrorism, Iraq, or Iran are all about. It also drowns out lots of other issues that need to be aired in a presidential election year. For years, I've been skeptical about the preponderance of "big ticket items" in the US military budget, such as carriers and main battle tanks. Sure, the United States needs some of them...But how many, really? Especially when they contributed very little to the "little wars" the US was actually fighting? With the end of the Cold War, the justification collapsed even further. First, adopt a defensive rather than an offensive grand strategy. 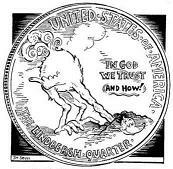 America followed a defensive grand strategy through most of her history. We only went to war if someone attacked us. That defensive grand strategy kept defense costs down and allowed our economy to prosper. We do not have to be party to every quarrel in the world. Unfortunately, the days of "we'll keep the sword sheathed unless we're attacked" are long over...If they ever existed in the first place. I'll assume for the moment that Lind is describing the United States before Pearl Harbor--before WWII made Americans into energetic internationalists. The pre-WWII United States was hardly pacific. The embargo on Japan that triggered the Pearl Harbor raid might not have been a military action, but it was hardly isolationist. The US objected to Japanese imperialism in China and Korea--hardly a policy based strictly on direct threats to the United States. In fact, it was a preface of American internationalism to come. The United States was worried about markets and resources in East Asia; the "special relationship" made it easier for the United States to respond to Japanese moves against these markets and resources. Decades earlier, the United States had sent expeditionary forces to China. During the Boxer Rebellion, the United States fought alongside Europeans and Japanese to maintain their collective grip on China. And China was hardly the only place where the United States was willing to send its armed forces. While Americans might not have been part of the race for Africa, they did defend their great power supremacy in the Western Hemisphere from both external and internal threats. Nicaragua, Haiti, Mexico, the Dominican Republic, Panama...While these might not have been major wars, they were hardly defensive. Therefore, WWII wasn't the first time that Americans were willing to use force to defend interests outside the territorial United States. American isolationism slowed down the grand strategic logic that led countries like Britain to see their interests threatened in every corner of the world (if we're worried about India, we have to be worried about Afghanistan...). However, the pull persisted, in spite of recessions and depressions. Second, scrap virtually all the big ticket weapons programs such as new fighter-bombers, more Aegis ships, and the Army’s Rube Goldbergian Future Combat System. They are irrelevant to where war is going. No argument here, as long as there's an actual review, not a stampede. The US still needs to project power in a lot of places, if not everywhere. If some new weapons systems or upgrades to existing ones can help, let's still pursue them. Third, as we cut, preserve combat units. That means, above all, Army and Marine Corps infantry battalions. Cut the vast superstructure above those battalions, but keep the battalions. Infantry battalions are what we need most for Fourth Generation wars, which we should do our utmost to avoid but which we will sometimes be drawn into, even with a defensive grand strategy. This may be the bitterest pill of all for the services to swallow. The Air Force and Navy would have to accept the primacy of ground forces. The Army would have to reform its structure and culture even further from the centrality of the divisional organization. Giving up a new weapons might be annoying; changing the way the Army operates will be agonizing. In the Navy, keep the submarines. Submarines are today’s and tomorrow’s capital ships, and geography dictates we must remain a maritime power. Keep the carriers, too, though there is little need to build more of them. Carriers are big, empty boxes, which can carry many things besides aircraft. Mothball most of the cruisers and destroyers. Build lots of small, cheap ships useful for controlling coastal and inland waters, and create strategically mobile and sustainable “packages” of such ships. Being able to control waters around and within stateless regions can be important in 4GW. Now we're in the outskirts of Cloud Cuckoo-land. Submarines can't handle all the missions that missile-armed surface ships or carrier-based aircraft perform. Sure, we might be fighting more little wars than big ones, but we do need, on occasion, to fight something like Operation DESERT STORM, threaten to use air and missile strikes to achieve foreign policy goals. Plus, a littoral navy that Lind is describing can't deploy across the globe--they're littoral. I'm all for reducing the overall size of the Navy, but a Navy of submarines and modernized PT boats couldn't handle all the critical missions. Fighter-bombers are largely useless in Fourth Generation wars, where their main role is to create collateral damage that benefits our enemies. Keep the air transport squadrons and the A-10s, and move them all to the Air National Guard, which flies and maintains aircraft as well as or better than the regular Air Force at a fraction of the cost. Reduce the regular Air Force to strategic nuclear forces and a training base. Ladies and gentlemen, welcome to downtown Cloud Cuckoo-Land. Not every war the United States will fight will be a counterinsurgency war. People killed by American bombs in a conventional war might still appear on the evening news, often as a tool of "fourth generation war" used against us. But is this an argument for not fighting conventional wars, in which bombers and fighter-bombers play an important role? If I have to shoot down enemy fighters, or deliver a "bunker-busting" payload against a highly reinforced enemy HQ, I'd rather not depend on A-10s, thank you. And if we're giving the A-10s to someone, why not the Army, to improve close air support coordination and better protect their budget? There's a lot of merit in some of Lind's recommendations, and we've had decades of inattention to the real needs of fighting wars that were smaller and wholly unlike the hypothetical NATO/Warsaw Pact clash over Central Europe. However, you can go too far in the other direction. According to her bio on Wikipedia, Dana Perrino--who finds military affairs baffling, and didn't know what the Cuban Missile Crisis was--majored in political science and communications at Colorado State University-Pueblo. No information about her GPA is available. The rest of the world is not on hold while the United States continues to dump more of its blood and treasure in Iraq. In the Balkans, angry Serbs attacked UN and NATO forces. Beyond the Secretary of State's obligatory tut-tutting ("very concerned"), what else could the US do in the Balkans? The White House and Defense Department have, for the last several years, been trying to "explore a new formula for our overseas presence." That's polite language for a permanent presence in the Middle East, based on "status of force agreements" (SOFAs) with countries like Pakistan. A recent diplomatic exchange between the United States and Pakistan provides a window into this campaign. The United States has learned a hard lesson about democracy and constitutionalism. No declaration of war sanctioned the Iraq war. No Constitutional principle justified the warrantless wiretaps. No American law or treaty allowed Guantanamo Bay. All of these mistakes have hurt, not helped, the real fight against domestic and international terror. There's another word for a SOFA: treaty. According to the US Constitution, the Senate must ratify any treaty. Using a different word than "treaty" does not change that obligation. The United States is asking Pakistan for permission to operate militarily inside Pakistan, while granting immunity to US personnel for any of their actions during these ventures. Robots don't enforce the Constitution; people do. Those people--in Congress and the Supreme Court--are ultimately responsible for both any failure to uphold the Constitution, and any consequences that follow. During some public discussions of US nuclear strategy, you'll hear US officials justify the maintenance and modernization of the American nuclear arsenal, based on fears of a future enemy. Clearly, we don't have a great power or superpower competitor that matches the bad old Soviet Union...But who knows what the future will bring? A country already armed with nuclear weapons might suddenly turn them on us. Russia, of course, is the country that is most capable of delivering this kind of grand strategic surprise. A country with modest or no nuclear capabilities might suddenly acquire weapons that could be used against US targets. For example, China's energetic modernization program might conclude with a sizeable number of nuclear-tipped missiles that could strike American cities. Iran might develop nuclear warheads delivered by courier, not missile. A quick aside: you can see the risk the United States has taken in neglecting the program of locking down and eliminating Russian nuclear weapons that started after the end of the Cold War. Once the Bush Administration lost interest, the risk that Russia might pull either kind of surprise--a change in intentions, or an increase in capabilities--increased substantially. If you think that the "placeholder enemy" rationale doesn't have a prayer of flying with the American public, think again. From WWI to today, American voters has had practically no awareness of the size or nature of the US government's chemical and biological weapons programs. How many Americans today know that, in 1993, the US government agreed to the destruction of all chemical weapons by 2012? Who, outside a small group of specialists in this area, knows how much progress the US government has made? The obvious question, of course, is why the US government was developing and storing tons of VX, sarin, and mustard gas in the first place. Against whom were we going to use chemical weapons? During the Cold War, you might imagine a temporary deployment of chemical weapons to stall a Soviet assault into Western Europe. However, if the situation ever got that bad, a far more horrible nuclear exchange might be in the offing anyway. After the Cold War, who would be the target of 31,000 metric tons of chemical weapons? And how many Americans knew their government had them? If the US government can hide capabilities in plain sight, so too can it continue to develop war plans that don't make sense in light of the current world situation. Between the World Wars, American military strategists developed the "Rainbow plans," designed to respond to practically any threat from beyond American's borders. While War Plan Black, aimed at thwarting German aggression, in hindsight seems like justiifed caution, how much sense did the premise of War Plan Red, a major war against Great Britain, make? War Plan Red envisioned a war across the US-Canadian border, with the possibility (as described in War Plan Emerald) of supporting an uprising in Ireland. In other words, the US government can maintain all sorts of plans and capabilities without the knowledge or assent of the American electorate. The biggest obstacle today, however, is cost. Since 2001, the strains on the military budget aren't confined to the Army and the Marines. 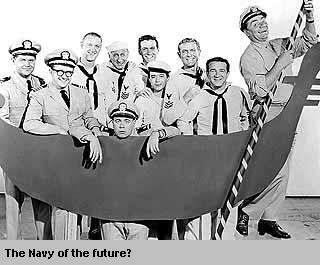 For example, the Navy's next-generation destroyer, code-named DDX, faced opposition based on justification (why this weapons program, instead of something that might help the wars we're actually fighting?) and cost ($2.6 billion for the first two destroyers). However weird it might seem to be buying destroyers while improvised roadside bombs continue to kill American soldiers, the chance that these destroyers might be used, in actual war or just a show of force, is much higher than the use of nuclear weapons. While we might still be living in the waking dream where funding for the Iraq war (approximately $2 billion per week) appears from thin air, we're soon going to wake up to some hard budgetary realities. (Perhaps, conveniently, right after the 2008 election.) Nuclear weapons programs are going to face some minor public scrutiny, and even tougher resistance from within the US government itself. Who knows, there may be some future, nuclear-armed enemy worth our concern. However, we won't have the luxury of such concerns, as long as the US military continues to bleed in Iraq, and the US economy begins to sputter. Another potential use of the American nuclear arsenal that appears to be off the table is counter-proliferation. In other words, US leaders are not willing to use nuclear weapons to stop even the worst adversaries from acquiring nuclear technology, despite the high stakes involved. That situation is not unique to the post-Cold War era. In the early days of the US-USSR confrontation, the United States had substantial nuclear superiority. While many practical considerations restrained US decision-makers--for example, the high risk of a Soviet invasion of Western Europe--other constraints overshadowed any cold-blooded calculations about what it might take to stop the Soviets from expanding their nuclear arsenal. Americans feared the nuclear cataclysms that the future might bring if the USSR were to acquire hydrogen bombs, submarine-launched nuclear missiles, or MIRVed warheads. However, under no circumstances did US leaders think that the prevention of hypothetical carnage, however great it might be, justified the actual carnage that a disarming first strike would create. The horror of any nuclear attack, even if it were limited to Soviet military targets, overruled any argument for a disarming strike. American leaders did not want to be the executioners of millions of people, even if it might prevent an even greater cataclysm in the future. No one wanted to argue the merits of one apocalypse over another. Instead, US decision-makers focused on how to reduce the risk of any nuclear war. Crisis management and diplomacy, not pre-emptive strikes, became the tools of choice. Since the Cold War, the United States has had several opportunities to prevent enemies--Iran, North Korea, and Libya--from gaining nuclear technology, through the most brutally direct methods possible. Regimes that described the United States as the central engine of all evil in the world were apparently eager to acquire the most dangerous weapons in the world. Still, American leaders did not see any justification for a pre-emptive nuclear strike, even if these regimes were powerless to respond. In other words, humanity operates at some threshold in US foreign policy. A suitcase bomb, built by the Iranian government and smuggled into an American city, is almost too horrifying to envision. Nevertheless, to prevent that scenario, American leaders were not willing to kill millions of Iranians. The US might credibly threaten conventional war, as the Clinton Administration did in 1994 against North Korea. Nuclear weapons, on the other hand, seem to be a poor tool for counter-proliferation. Not even the threat appears to be useful. Cheryl of Whirled View kindly indicated that continued posts on the future of US nuclear strategy from national security bloggers were still welcome. Therefore, I'll throw in a couple of my own observations on this topic, starting with a few words about compellence. In a widely-cited Harvard Business Review article, Michael Porter pointed out that strategy includes explicit choices about what you don't do. While not everything in Porter's article applies equally to corporations and governments, that statement certainly does. When the choice involves nuclear weapons, the consequences of what you do and don't do are, of course, potentially cataclysmic. For the first two or three decades that the United States possessed a nuclear arsenal, American nuclear strategists tried to figure out whether these fearsome weapons could be used not just for deterrence, but compellence. In less academic terms, you might summarize the question as, "Hey, if we have nuclear weapons, and lots of other countries don't, can't we use the nuclear threat to bully them?" Surprisingly, the answer appears to be, "No." Thomas Schelling, whose landmark book Arms and Influence is the inspiration for the name of this blog, was one of many strategists who approached this question in the abstract. Sometimes, the tools of inquiry were analogies, such as Schelling's famous metaphor of the game of chicken. At other times, the tools were more quantitative, such as the complex mathematical projections of missiles, megatons, and mass casualties, to think as objectively and precisely as possible about, as Herman Kahn called it, "the unthinkable." The analysts at the RAND Corporation and the Defense Department engaged in this research found many ways to deter a Soviet nuclear attack. They did not, however, find any sure-fire ways to use the US nuclear arsenal to blackmail the Soviets, Chinese, or even the many countries that lacked nuclear weapons of their own into taking actions they might otherwise resist. In other words, nuclear weapons could stop the other superpower from doing something; it was much, much harder to devise techniques to compel other governments to acquiesce to American wishes. Historical experience also indicated that compellence was, perhaps, a pipe dream. The United States chose not to use nuclear weapons against the North Koreans and North Vietnamese. Just as importantly, the US did not make serious, consistent threats of nuclear attack, if these two adversaries did not halt their aggression against their southern neighbors. In other Cold War confrontations in which the other side lacked nuclear weapons--for example, the Arab-Israeli wars--US leaders largely kept the nuclear threat in its sheath. The exceptions looked more like deterrence, but on a smaller scale. For example, the US went to a high degree of nuclear alert in 1973 to make it clear to the USSR that any Soviet military intervention in the Yom Kippur war. The Eisenhower gave the People's Republic of China a clear glimpse of the American nuclear threat during the Quemoy-Matsu crisis. Again, the goal was more deterrence--stopping the Chinese from expanding the conflict beyond the two disputed islands to Taiwan--and less compellence. Why did compellence turn out to be a mirage? Only part of the answer depended on the unique balance of power mechanics of the Cold War. Both superpowers were wary of nuclear threats, for fear that the other superpower might get involved in the conflict, raising both the stakes and unpredictability of any conflict. The WWI-like escalation spiral, from regional crisis to global war, haunted both theorists and practitioners of nuclear diplomacy. However, the fear of escalation was hardly the only reason why compellence practically disappeared from US national security policy. The credibility of the threat was questionable whenever US cities were not directly at stake. Just as Hitler once wondered, "Who would die for Danzig?" American leaders asked, "Who would believe us if we threatened nuclear attack over the Soviet repression of Hungarian independence?" The credibility of nuclear threats is always the most valuable part of having a nuclear arsenal. Otherwise, nuclear weapons are only useful by actually using them, which is the worst of all possible scenarios. Compellence, on the other hand, degrades the currency of US nuclear threats, since the stakes are far lower for the United States than the "nightmare scenario" of classic deterrence. The psychology of international relations creates additional obstacles to successful compellence. Deterrence normally stops actions that have not been started at all. The other side loses practically nothing for backing down, since nothing has happened. In many situations, such as the Clinton Administration's threats against North Korea, no one outside the two governments involved might be aware that a crisis has been happening at all. The threat, in these less dire circumstances, is not credible because no one believes that US leaders are either immoral or irrational enough to unleash mass carnage. That, too, is an important part of the credibility of US power and influence. Compellence, on the other hand, often requires the embarrassment or humiliation of the other side. Not only do the scenarios often start with public statements or actions (for example, "Disarm immediately, or else"), but the adversary may want to publicize US nuclear threats, to make its cause more sympathetic in the face of American bullying. The end of the Cold War, therefore, has not improved the opportunities for nuclear compellence. No modern-day John Foster Dulles will find an updated version of the "massive retaliation" doctrine any more successful than it was in the 1950s. WhirledView sponsored an excellent discussion of US nuclear strategy among various national security blogs. Very, very good reading. Click here for a summary of the discussion so far.